BREAKING: Wilson suspended for 20 games, without pay. Tom Wilson of the Washington Capitals has been suspended 20 games without pay for his illegal hit to the head of St. Louis blues forward Oskar Sundqvist. 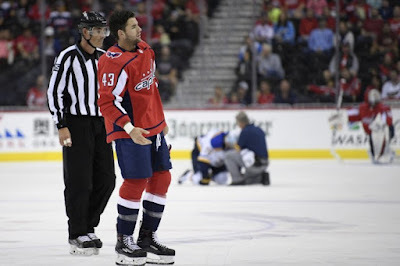 The hit occurred at 5:18 of the second period and Wilson was assessed a match penalty. Wilson's in person hearing was held on Wednesday with the NHL's Department of Player Safety. Since the hearing was in person, the league had the right to suspend him for more than five games. Wilson is considered a repeat offender under the terms of the collective bargaining agreement and will forfeit $1,260,162.60. The money will go to the Players' Emergency Assistance Fund.